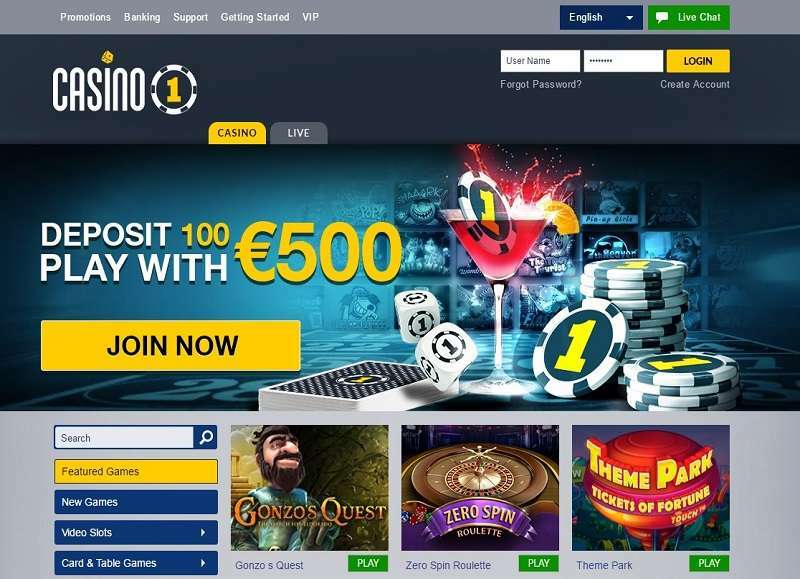 Casino1Club is a simple and straightforward online gambling establishment that’s all about offering you the best online games in a safe, secure and friendly environment. Here you’ll find a good selection of games, along with quite a few good promotional offers that you won’t want to miss out on. The site is very easy to navigate, and though there isn’t too much theming, it still looks attractive and is laid out well enough that you should find everything you’re looking for without any problems. No mobile version of the casino. The Casino1Club online was launched in 2016 and is operated by Game Tech Group N.V. Casinos. The aim of the establishment is simply to provide players with a superior and enjoyable online gambling experience. With this in mind, the casino offers hundreds of top-quality games by leading providers and keeps making the casino grow, with new game titles and promotional offers regularly added. The casino operates with a licence obtained from the Government of Curacao and uses the latest security measures to ensure that all players’ details and money are completely safe and protected at all times. There is quite a few Casino1Club bonus offers available. Welcome Package. 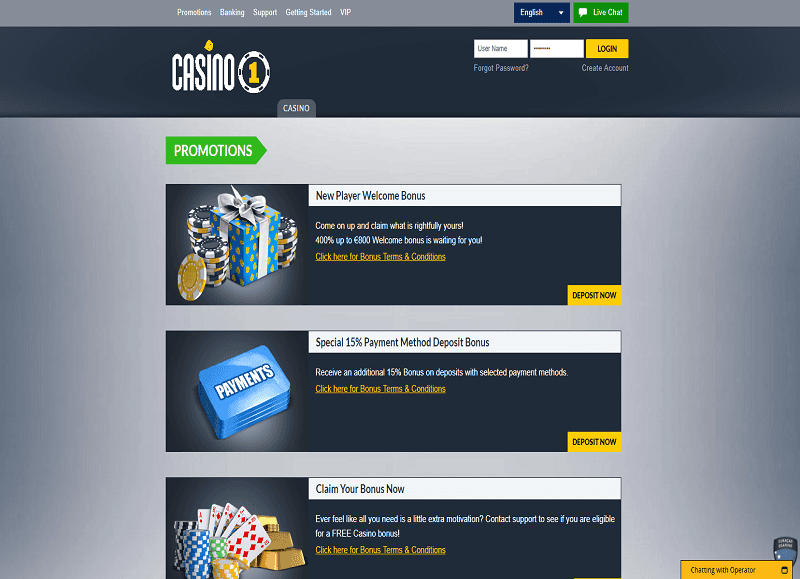 If you’re new to this gambling site, you’ll be eligible to claim the welcome offer for new players. Simply make your first deposit, which has to be of at least €20, and you’ll receive a 400% deposit bonus of up to €800. For first deposits made with certain payment methods, including Neteller, Skrill and PostePay, you’ll receive an additional 15% bonus of up to €1,000 on top of your first deposit bonus. To withdraw your winnings from the Welcome Bonus offer, you have to play through your deposit and bonus 33 times. For the 15% bonus with certain payment methods, you have to play through your deposit and bonus 25 times before you can cash out. Games contribute different amounts to the wagering requirements. For example, slots contribute 100%, though for table games it’s only 10%. Assurance Bonus. The casino also offers an Assurance Bonus. This can be claimed through the live chat feature only if you didn’t have any bonuses on your previous deposit. In addition to this, there’s a free casino bonus that certain players may be eligible for. Loyalty Points. Player loyalty is rewarded at Casino1Club through the comp points scheme. For every €10 you wager, you’ll earn 1 comp point. Once you’ve earned enough of these points, you can exchange them for cash to spend at the casino. The total amount of money you’ve wagered at the establishment is kept track of. VIP Bonuses. The casino has a four-tier VIP club and to reach a new tier you need to have wagered a minimum amount of money. Everyone starts off at the Silver tier and can progress to the Gold tier once they’ve wagered at least €5,001. The other two tiers are Platinum (€15,001 in wagers required) and Black (€25,001 in wager required). The higher your tier, the more bonuses, perks and rewards you can look forward to enjoying. These bonuses are active at the moment of writing this review. The establishment can change them or add new offers from time to time. So, it’s players task to learn all the current bonus offers with their terms and conditions before accepting any of them. There are close to 600 slots you can play at the casino, with the collection offering over 560 modern video slots and over 20 classic slots with much simpler gameplay and fewer bonus features. Also among the slots collection are some progressive jackpots such as Carousel, Knockout, Fear the Zombies and Book of Tattoo. There are plenty of recently released slots to be found at the casino website since the establishment adds new game titles fairly regularly. It’s recently introduced slots such as Bachelorette Party, Joan of Arc, Atlantis and Epic Gladiators, to name a few. Players can try them out in demo modes without download. As for table games, you’ll find nine options for roulette, eight for blackjack, three for poker and a total of four other games, including baccarat and keno. While there’s a good enough range of traditional animated table games, the casino also offers quite a few live casino games. They are real-life games broadcast live for players anywhere to participate in, are supplied by four different providers. There are nearly three dozen options for live games available in total, with the collection covering blackjack, roulette, baccarat and casino hold’em. Rounding off the casino’s games collection are half a dozen scratch cards, over a dozen video poker and a selection of others, including a few keno ones. The Micro Bet games are presumably those with very low betting limits, while the VIP Games are presumably VIP-only variants that have very high betting limits. Casino1Club is available to access on a wide variety of mobile devices. If your device runs on either iOS or Android, you’ll be able to visit the Casino1Club mobile casino simply by going through your device’s web browser. The mobile casino is fully compatible with both smartphones and tablets and is designed to run smoothly on both. There isn’t an app for Casino1Club yet, though the mobile casino is a worthwhile option if you’re looking to gamble on the go. It offers a good number of mobile-friendly games and is simple in its design and layout, so you should be able to navigate it and find what you’re looking for without any problems. Some of the payment methods listed above are international and can be used in pretty much every country. Visa, Neteller, Skrill and Mastercard are examples of internationally accepted payment methods. As for the others, they’re either accepted only in a single country or a small number of countries. For example, PostePay is only available for people in Italy, and Multibanco can only be used by those in Portugal and Brazil. Whichever payment method you choose to use, you’ll find that deposits are free and instant. As soon as you’ve confirmed your deposit, the money will appear in your Casino1Club account immediately, ready for you to start using on the casino’s many games. For withdrawals, there may be fees, though the casino doesn’t go into much detail about when there are fees for making withdrawals and when there aren’t. Information about wait times for withdrawals isn’t readily available at the casino. It’s usually the case that when making a withdrawal, you first have to wait for the casino to process your withdrawal request, which can take a few working days. Then once that’s done, you usually have to wait a few more working days for your money to reach you, though if you’re using an e-wallet, your money should reach you as soon as your request has been processed. This may well be the case at Casino1Club. Casino1Club has quite a good customer support system in place. If you have any sort of question or issue, you’re encouraged to first check out the FAQ section as you could well find the answer or information you’re looking for there. If you don’t find what you’re looking for there, you have several ways of getting in touch with the customer support team available. You can use the live chat feature, send the team an email or get in touch over the phone. The site claims that customer support is available 24/7; however, it lists availability times for the phone line as 9 am-10 pm. It could well be that the other two are available round-the-clock, i.e. there’s always someone available to speak to using the live chat feature, and emails should receive a reply quite soon, no matter what time it is. It’s also unavailable in a number of other countries where online casinos and gambling are prohibited by the country’s laws. It is recommended to check your country's laws and regulations concerning online gambling before registering with this casino in order to avoid future misunderstanding with the establishment. This line-up of over 20 providers is very good indeed, as it includes lots of lesser-known and more up-and-coming providers. There are a few big-name providers listed here, such as Evolution Gaming, Play’n Go and 1x2 Gaming, though some of the especially big ones, such as NetEnt and Microgaming, are noticeably absent from the list. Most online casinos have games from these two providers, so to come across one that doesn’t is quite refreshing. 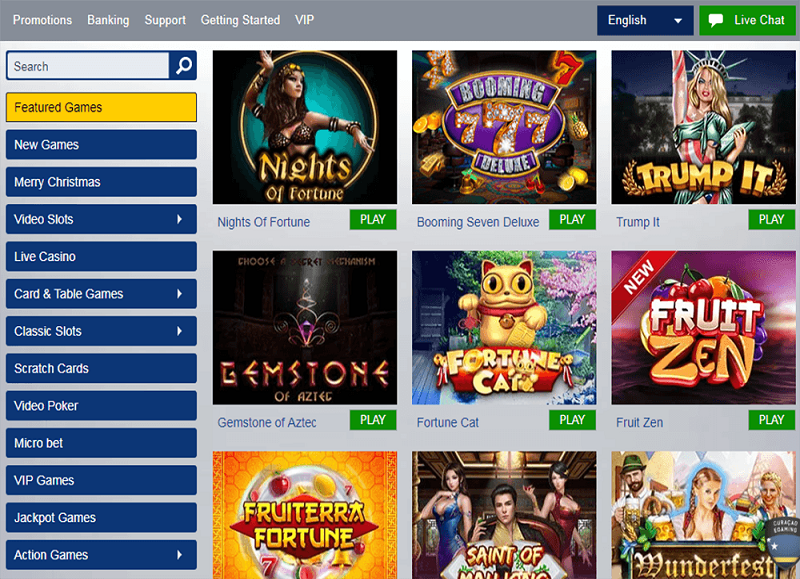 Though you obviously won’t find any NetEnt or Microgaming creations here, you will find plenty of others that are definitely worth checking out. Casino1Club is a fairly large online casino that simply aims to offer players of all tastes good-quality online gambling experiences. The site is straightforward in its design and layout, making it easy for those new online casinos to get to grips with everything. The casino has a good selection of games to offer, along with a quite generous welcome offer for new players and a number of promotional offers for those already signed up. Plenty of widely used payment methods are accepted, and the customer support system appears to be quite good, with several ways of getting in touch provided and 24-hour live chat available. You can access the Casino1Club casino on your mobile device as well. Though there’s no app available to download right now, there’s still a perfectly decent mobile casino that lets you play some of the casino’s most popular games while you’re out and about.